The light-emitting diode (LED) Lights is environment friendly and more secure than fluorescent because it works at much lower temperatures. An incandescent bulb gives off more energy as heat rather than light, something to do with the resistance of a Tungsten filament, therefore LED is considered better than fluorescent even when the lumens per watts is the same. But is this the only reason, especially to answer that LED is a better option comparing on same lumens per watts? But before we discuss this any further, let us look at this interesting table – The table below shows the amount of brightness in lumens one can expect from different wattage light bulbs. We can clearly see that the LED bulbs require much less wattage than the CFL or incandescent light bulbs, which is why LED bulbs are considered as more energy-efficient and long lasting than the other types of bulb. Now, there is another chart which compares the lumens per Watt of different light appliances include LED and incandescent bulb (Linear Fluorescent). It is clear from the table that the LEDs use less power (watts) per unit of light generated (lumens). The light bulb efficiency is measured in terms of lumens per watt—the amount of light produced for each watt of electricity consumed. More lumens per watt mean more light for your money. A close look at the chart will tell us, that the lumens per watts are nearly the same for both the light bulbs. A LED is a semiconductor device that emits visible light when an electric current passes through it. 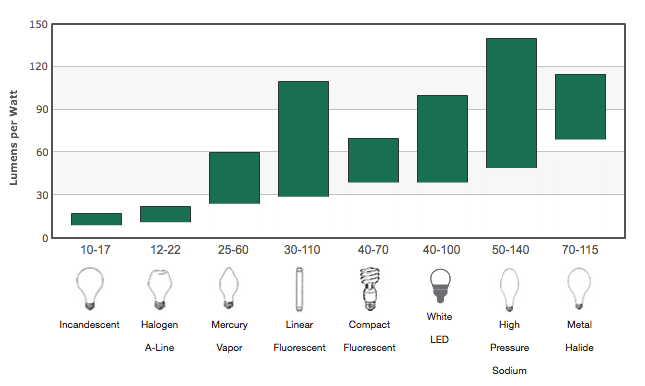 Presently, the LED technology is advancing rapidly, with many new bulb styles available. Initially more expensive than other category of bulbs say the CFLs and of course the incandescent bulbs, LEDs bring more value since they last longer. Also, the price of LED bulbs is going down each year as the manufacturing technology continues to improve and the government is also providing subsidy to its sale. Let us divulge some basic information on the fluorescent light bulbs also. Technically speaking, in the fluorescent light bulbs an electrical gas discharge is maintained in a tube (with a thin layer of phosphor on its inside surface). The gas, which is often a mercury vapor, emits ultraviolet radiation causing the phosphor to fluoresce. A CFL, or compact fluorescent, is simply a miniature version of a standard fluorescent light bulb, and they screw into standard lamp sockets, giving off light that looks similar to the common incandescent bulbs. These CFL bulbs fit in standard light sockets without any adaptor and not like the big fluorescent lighting we associate with the industrial lightning or street lightning. Now, coming to the main question posted at the top of the article – Why LED lights are better than Fluorescent lights even when lumens per watts are the same? To answer this, we must understand that these LEDs provide a unidirectional flow of light (or emit light in a particular specific direction only) but the incandescent and CFLs emit light in all directions, they have a spread of 360 degree. Typical beam angles (or spread) for LEDs, available in the market are in the range of 15, 30, 45, 60 and 100 degree and for general illumination, it is 120 and 180 degree. In fact, the most common LEDs available for general illumination are with a beam angle of 120 degrees or more, and they can be treated as any other CFL lamps. Now the spread (we are also call them beam angle) is directorially proportional to division of light (lumens). More spread in case incandescent and CFLs will cause more division of lumens, and naturally causing less brightness. In incandescent and CFLs, the light with a much higher beam angle gets distributed. Thus, if our requirement is for spot lightening (a concentrated light for a limited space); more number of these bulbs will be required to be installed, requiring greater power. Therefore, LEDs being unidirectional will produce a lot of brightness compared with any type of fluorescent lights even though the lumens per watts are the same. Last longer — LED bulbs last up to several times (10 times) more than the compact fluorescents, and far longer than typical incandescent bulbs. Durable – since LEDs do not have a filament, they are not easily damaged or become useless, say on falling circumstances. Cool – LEDs produce 3.4 btu’s/hour, compared to 85 for incandescent bulbs. So they do not cause heat build-up. More efficient – LED light bulbs use only 2-17 watts of electricity (1/3rd to 1/30th of Incandescent or CFL). Cost-effective – although LEDs are initially expensive, the cost is recouped over time and in better savings. The cost of new LED bulbs has gone down considerably in the last few years and is continuing to go down. Today, there are several new LED light bulbs for use in the home, and the cost is becoming less of an issue, even the Indian government both at centre and state are providing subsidies. Even these days the government is also acknowledging such benefits. As per news report published in September 2015, the Indian union power minister, Mr. Piyush Goyal, announced “13.46 million bulbs have been distributed so far and the government has set the target of 700 million bulbs in the next two years and nine months”. 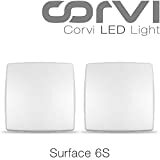 We will cover the subsidy to the LED bulbs in great details, in some other article.